When given reign over the remote, most of the men in your life (your dad, your brother, your S.O., or guy friend) probably turn directly to ESPN. Ahhhh, yes… the manliest of all man channels. This, ladies, is simply their very own soap channel. It’s got it all: the gossip (Urban Meyer to OSU?! 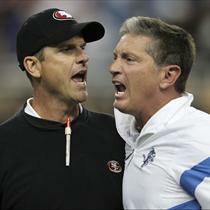 ); the drama (Jim Harbaugh/Jim Schwartz fight? !… or rather, “confrontation”); and the divas (see NBA Lockout). The sports world is like The Real Housewives of New Jersey with a splash of testosterone added to billions of dollars, then multiplied by 15,408 (that’s an approximate number of coaches and players in college football and the NFL). Sound interesting yet? Let me cut to the chase. Girls, you and the sports-crazed men in your life have a lot more in common than you think. It IS possible to share autumn weekends together… and enjoy it! Consider this. Your favorite entertainment shows like EXTRA and Entertainment Tonight draw a distinct parallel to the holy grail of ESPN, SportsCenter. You know exactly what I’m talking about. The “dunnuh-dun…dunnuh-dun” is just as recognizable as The Young and the Restless‘ theme. Entertainment shows give us a daily rundown of what’s going on in Hollywood. Sports fans get the latest news and gossip from SC and other ESPN programs. But wait, there’s more. Ever watch The View? Have you ever wished you had a mute button for a host or two on the show? 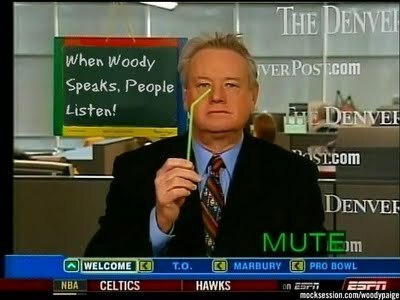 Well ladies, the men have their version too… and in the case of Around the Horn… they’ve beat us to the mute button. Pardon the Interruption (PTI) could also be thrown into the same category as The View or The Talk except for the fact that they’ve limited the bickering to just two hosts. Genius, right? How about the Best & Worst-Dressed lists on Fashion Police? Male version: SportsCenter‘s Top Ten and Not-So-Top-Ten Plays. Lastly, we come to one of my guilty pleasures: The Bachelor/Bachelorette. During the rose ceremony the contestants all stand at attention wearing their very best. Wide-eyed and nervous, they wait intently for their name to be called. It’s hard not to commiserate with these poor people at a time when they are so vulnerable. I’ve seen the same look on the faces of football players waiting for their names to be called during the NFL Draft. Don’t believe me? Check out the look on Brady Quinn’s face as he anticipated his selection (then felt the rejection) in 2007. Originally projected to be a top-five pick, Quinn was chosen 22nd overall by the Cleveland Browns. As you can see in the clip below, most expected the Miami Dolphins to pick up Quinn with the 9th selection… including the director, as he chooses to focus on the quarterback during the announcement. Ouch. How can you not feel for the guy?! When it comes to the Draft however, the athletes are vying for a baseball cap and a football jersey instead of a rose. Oh, and a big check. Bottom line is that we become wrapped up in “our shows” because we get wrapped up in the characters and the story line. We begin to feel like we know these people and end up rooting for or against most of them. We can name housewives, Grey’s Anatomy doctors, guidettes, their relationship statuses and more in a heartbeat. The sports nut in your life can dish names, numbers, stats, and game-day status just as quickly. Your first assignment…. pick your team if you don’t have one already. Have no clue where to start? Pick the team with the best colors. It doesn’t matter. Google them and catch up. The season has already started, so just like YOUR shows, your team already has a story line established and history beyond just this year. This season has been extremely unpredictable! The underdogs (ahem, LIONS) are winning. The usual top-contenders (COLTS! cough, cough) are losing…. NEITHER of these are normal! As far as college football goes, I’ll give you all a head start: Notre Dame is the best. EVER.